Arcades that don’t feel like arcades, living rooms that don’t feel lived in—we take a look at virtual reality’s problem with perfection. I’ve been pondering suspension of disbelief lately. It’s a thing we’re all familiar with, I think. It’s the state that keeps us from standing up in the middle of a movie theater during any given action film, pointing at the screen, and yelling “What?! That doesn’t even make any damn sense!” It’s the (extremely necessary) ability that lets me look at video games and say “This looks sort of like real life, I buy it”—and the one that leaves me reeling when I go back to the same games ten years later and realize how horrendous they actually looked. But virtual reality is proving to be the greatest challenge yet to my willful suspension of disbelief, and it always surfaces in the strangest ways. The more these digital worlds become lifelike, become real, the more I realize the true challenge isn’t in making them perfect. It’s in making them imperfect. Recreating reality is simultaneously the most pedestrian and most difficult trick you can do with virtual reality. It’s the most pedestrian because…well, you’ve been given a blank slate with nearly limitless possibilities, and what do you choose to do? Create something that already exists. This is what’s so frustrating about Netflix’s recent foray into virtual reality, for instance. Given an infinite amount of possibilities, Netflix chose to let you watch TV in a living room—something I (and many others) am already innately familiar with. But it’s this familiarity that also makes it the hardest trick to pull off. I’ve watched TV in dozens of living rooms in my life—my childhood home, my college dorm, my college apartment, my current apartment, friends’ homes and apartments, my grandparents’ house. I have a lot of references as far as the “Watching TV In a Living Room” experience is concerned. By contrast, I have zero reference as to what “Meeting an alien on the moon” is like in real life. What I find increasingly fascinating about the uncanny valley phenomenon is noting the small things that set me off, that make me uneasy. Often it’s the sterility. It’s the subtle nobody-lives-here sensation that makes an abandoned house so eerie. In Netflix’s idyllic approximation of the Modern Wealthy American’s living room it’s the way all the items are arranged just so, the perky way the couch sits as if it’s never fulfilled its god-given destiny of having people’s butts on it, the way the TV sits free of all dust and grubby fingerprints. We are creating museums. Amazing virtual museums. Museum dioramas are a far cry from reality, though. If our aim is ostensibly to create a virtual reality nearly indistinguishable from “real reality,” then we need to overcome this frozen-in-time feeling. And that’s hard. It’s hard to make things feel lived-in. I ended up thinking about this due to some hands-on demo time with Oculus Arcade last week. 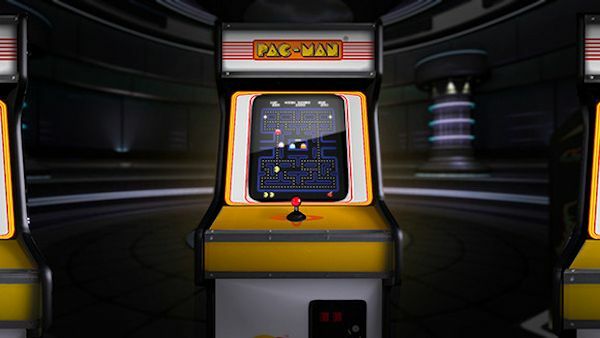 The app, which comes with any Samsung Gear VR headset, features a collection of classic arcade games from Sega, Midway, and Namco. This is no mere MAME emulator, however. Oculus Arcade puts you, as you might expect, in a virtual arcade—or at least something we’d call an arcade for lack of a better term. There are two dozen arcade cabinets sitting ready, from Pac-Man to Altered Beast to Gauntlet. I played a bit of Joust, one of my favorites. The game ran well, which is no surprise—MAME emulation has been around for decades, and the Joust ROM takes up only about 32K of space. This isn’t exactly Crysis. I flap-flap-flapped my wings and collected eggs and fought the pterodactyl, and it was identical to any other game of Joust I’ve played. Except, you know, in virtual reality. In this weird museum environment. Arcades are a place of sensory overload. It’s dozens of games acting as their own lo-fi advertisements, with brightly lit marquees and flashing lights. Even then the room’s always a bit too dark, which in my childhood meant “mysterious,” but which now often means “sort of dank.” In the old days it smelled like cigarette smoke. These days, with California’s focus on healthy living, it typically smells like stale sweat—or, at a barcade, like spilled beers. The place is deafeningly loud, cabinets cranking out beep-boops and iconic music while players hammer on the buttons. And it’s tactile. Everything about an arcade is tactile. Slamming quarters into the slot, tapping the Start button, flexing your hands on the controls, leaning against the marquee—it’s an experience. It’s alive. Oculus Arcade has none of this. Here, Sega and Midway and Namco’s contributions to gaming history live on in perfection. The joystick will never yaw left, the buttons will never get sticky. The side art won’t be scratched. You’ll never gather ’round a cabinet as your friend tries to break the high score, or have to wait for someone to finish up on your favorite game. You’ll never run out of quarters. This problem is unique to virtual reality. I’ve played Joust on dozens of machines over the years—handhelds, PCs, custom-built MAME cabinets, and even this Joust keychain. Each of these machines offered me the ability to play Joust with a minimum of hassle, but the value proposition was always clear: “Hey, would you be interested in playing Joust on [insert machine here].” Not once have I contemplated whether I was “really experiencing Joust,” because clearly the answer was no. The difference with the Oculus Rift (or any virtual reality) is a shift in the value proposition. It’s no longer “Do you want to play Joust on the Oculus Rift?” It’s “Do you want to relive what it’s like to play Joust in an arcade?” It’s the fabled Valhalla of “Presence” that virtual reality developers talk about—making the player believe for a moment that he or she is truly in the simulation. Traditional suspension of disbelief works a lot better on a monitor, because the very act of looking at said monitor and believing the characters on it had any reality whatsoever fundamentally requires suspension of disbelief. Presence though, that’s harder. I’ve said before that virtual reality—when successful—doesn’t feel so much like “Playing a game” as it does “Living your life.” Memories made feel like memories of things you did, not like memories of playing a game. That goofy-looking headset strapped over your eyes tricks your brain into registering things differently. And that’s amazing. But in order to reach that point, to reach the heightened state of awareness responsible for Presence, everything needs to be perfect. The irony is that in virtual reality, “perfect” means “less-than-perfect.” It means scuffs on the coffee table, shoes carelessly thrown in the corner, fingerprints on a coffee cup. It means trash in the subways—not heaps of trash, but the cough drop wrapper that fell out of someone’s purse and got swept under a bench, or the bottle someone left on the bench. It means people yelling and Journey blaring and lights flashing and the ceaseless symphony of the arcade. Reality is not sterile. It is not perfect, or quiet, or pristine. If we’re to reach Presence in virtual reality—not just for a moment but for long stretches of time—we first need to look at how we create virtual environments. Those hoping to remake reality need to work harder on randomness, on chaos, on the telltale signs of life. Otherwise we’re playing Joust in mausoleums.